Tears flowed freely in the offices of The Phnom Penh Post on Monday. Some of Cambodia’s most hardened reporters embraced their colleagues as their faces crumpled. Journalists want to report the news, not become it. But the editorial gutting of the last independent media outlet in Cambodia saw reporters scrambling to document what felt like the demise of their own masthead. I have been a proud reporter at the Post since the beginning of 2016, but most of my Cambodian colleagues have been working at the paper for many years, even decades. My editor in chief, Kay Kimsong, was unceremoniously sacked on Monday morning. Five of our senior editorial staff walked out. More are likely to follow. On the weekend, the paper was sold by Australian mining magnate Bill Clough to a Malaysian investor, Sivakumar S. Ganapathy. With that sale disappeared a large and looming tax bill. Both the former and current owners promised that the Post’s editorial independence would remain intact. For some of the newsroom’s senior staff, that promise was irrevocably undone when they were asked to remove an article that shed light on Ganapathy and his company, Asia PR. Our reporters diligently researched and reported the facts: Asia PR listed one of its clients as Cambodian Prime Minister Hun Sen; in the past it ran a pro-government newspaper with potential links to a casino owner; along with other concerning business dealings in Malaysia. The article remained on the Post’s website until it was removed on Tuesday. In a meeting with senior staff and representatives of the Post’s new owner, a new editor-in-chief, Joshua Purushotman, was instated. Purushotman reportedly told those in the meeting he had received an angry phone call from Ganapathy at 2 am. “This article damages our reputation,” Purushotman was reported to have shouted, throwing the paper on the table. The room emptied out as our business editor, web editor, and a senior journalist tendered their resignations on the spot. Our managing editor had already resigned. It was a “mistake”, Kimsong said he was told, to allow a “damaging” article about the Post’s new owner to be published. Kimsong was fired with immediate effect. In a blur of confusion and shock, reporters oscillated between comforting each other and spilling into the meeting room to demand answers from our new management. They dismissed our questions, saying Kimsong’s sacking was simply a business restructure. At that point, the remaining journalists started to do what we are trained for. We asked hard questions. We took videos and photos as we interviewed each other. We took to Twitter. We began pulling together an article that would lay bare what had happened in our newsroom that day. After initially being rejected, the article was published in the next edition of the Post, although in a truncated form that removed references to a “purge” and cut context about the spiralling political situation and decimated media landscape in Cambodia. This is not the first time in recent memory that a Cambodian media outlet has unwittingly become the news. The fiercely independent Cambodia Daily was forced to close last year after it was handed an “exorbitant” tax bill. Some 30 radio stations were shuttered. Radio Free Asia was forced to close its Cambodia office and two of their former reporters were jailed on national security charges widely believed to be politically motivated. Australian film-maker James Ricketson, too, was jailed for flying a drone at an opposition rally and charged with “espionage”. Police detained a man on his wedding day for opining on Facebook that Hun Sen’s regime was “authoritarian”. Cambodia now ranks 142 in the world for press freedom after plunging 10 spots last year. In this climate of fear, self-censorship is rife. The media crackdown coincides with a political one; Kem Sokha, leader of the opposition party, has been arrested for “treason” and his party was forcibly dissolved in November, leaving a clear path to victory for a ruling party. 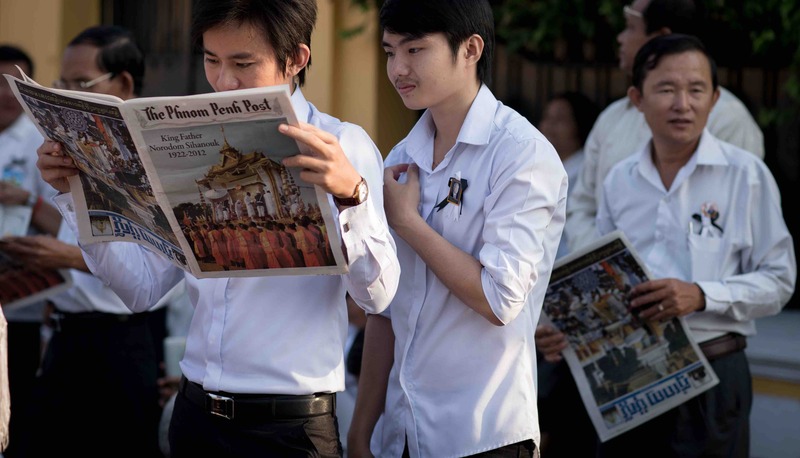 What we saw yesterday was a scene of mourning, not only for those who are no longer with the Post, but also for the paper’s editorial independence and, more broadly, for press freedom in Cambodia. We mourn, too, for those who stay. While many foreign reporters can resign, our esteemed Khmer colleagues, who have children to support, loans to pay, and a livelihood they are wedded to in their home country, cannot just leave. Many will endeavour, against all odds, to deliver independent, in-depth, critical news that holds the powerful to account during an election that has already been won. If the West allows Cambodia's democracy to fall without a whimper, the contagion of despotism will be hard to contain in Southeast Asia.